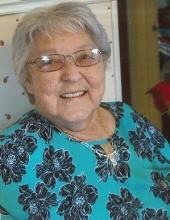 Lake City- Lula Beatrice Fry, 87, passed away Sunday, February 3, 2019 at NEA Baptist Hospital. She was born March 10, 1931 in Floral to the late William and Audie Isom Rand. Mrs. Fry retired from Coca-Cola and had also worked at Riverside School. She was a longtime member of the First Assembly of God and enjoyed singing in the church choir. She was an avid St. Louis Cardinal fan and loved horses. She will be remembered as a loving mother, sister and grandmother. She was also preceded in death by her husband, William Fry; four sisters, Beulah, Retha, Thelma and Josephine and four brothers, Charlie, Lester, Robert and Billy Ray and a brother-in-law, Gordan Fry. She is survived by her children, Linda Carner (Buddy) and Mike Fry all of Lake City and Judy Speakes (Darrell) of Jonesboro; nine grandchildren, Cindy Terrell (Steve) of Lake City, LeAnn Mansfield (Jamie) of Jonesboro, Misty Secrease (Rodney) of Paragould, Jeremy Speakes (Brandi) of Memphis, Jon Carner (Becky) and Justin Fry (Samantha) all of Paragould, Cody Fry (Nicole) of Fayetteville, Josh Carner (Sydney) and Tim Speakes (Kaitlyn) all of Brookland; two sisters, Agnes Wilson of Happy Valley, Oregon and Irene Friend of Nashville, Tenn; thirteen great-grandchildren, Sean, Layne, Adam, Cailyn, Kreed, Jovie, Sydney, Caden , M.J., River, Madi, Gabi and Anthony; five great-great-grandchildren, Hunter, Ellie, Wren, Lexi and Kylie; special niece and nephew, Bertie Lee and Ray Bob; a brother-in-law, Clarence Fry (Sharon) of Saffel. The visitation will be from noon until 2:00 pm Tuesday, February 5, 2019 at Gregg-Langford Bookout Funeral Home. A celebration of her life will be 2:00 pm Tuesday at Gregg-Langford Bookout Funeral Home Chapel with Rev. Nick Fletcher and Rev. Van Gilbert officiating. Interment will follow at Pine Log Cemetery. Honored to serve as pallbearers are her grandsons. A special thanks to Ridgecrest Nursing and Rehab, 4th E. floor nursing staff at NEA Baptist Hospital, Dr. Brock Harris and Dr. Mistie Charlemagne. To send flowers or a remembrance gift to the family of Lula Beatrice Fry -GLBFH, please visit our Tribute Store. "Email Address" would like to share the life celebration of Lula Beatrice Fry -GLBFH. Click on the "link" to go to share a favorite memory or leave a condolence message for the family.